Cost distance tools calculate for each cell the least accumulative cost to specified source locations over a cost surface. A source and a cost dataset must first be created. These datasets can be created in different ways with the tools available in the ArcGIS Spatial Analyst extension. In the following example, a least-cost path on which to construct a new road is needed. To create the path, first a cost distance surface must be created, which requires a source location dataset and a cost raster as inputs. The example will demonstrate creating a cost raster. The source is the starting point of your proposed feature for analysis. In the graphic below, you can see the area identified as the starting location (in red) for the proposed road. A cost raster identifies the cost of traveling through each cell. 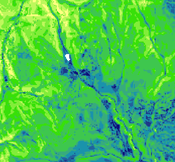 To create this raster, you need to identify the cost of constructing a road through each cell. 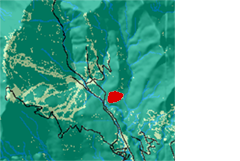 Although the cost raster is a single dataset, it is often used to represent several criteria. In this example, land use and slope influence the construction costs. Each of these datasets is in a different measurement system (land-use type and percent slope), so they cannot be directly compared to one another and must be reclassified to a common scale. In this example there are three general steps to create a cost raster. 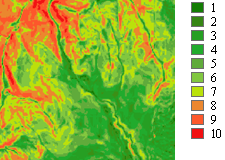 The slope and land-use rasters have been reclassified on a scale of 1 to 10. The attributes of each dataset should be examined to determine their contribution to the cost of building a road. For example, it is more costly to traverse steep slopes, so steeper slopes will be assigned higher costs when reclassifying this dataset. The graphics below display the results. The final cost raster is created by adding together the weighted datasets. The following diagram shows the final cost raster. 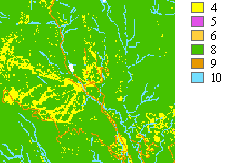 It is the result of reclassifying the input datasets of slope and land use; weighting each by 0.66 and 0.34, respectively; then combining the weighted datasets. This cost surface raster can now be used as an input into the Cost Distance or other cost tools.